In an age where so few studio recordings of operas are made compared to the decades of the second half of the twentieth century, it is rather refreshing to be presented with a lavishly produced account of one of the most popular works in the repertoire featuring some of the current age's strongest, starriest talents. 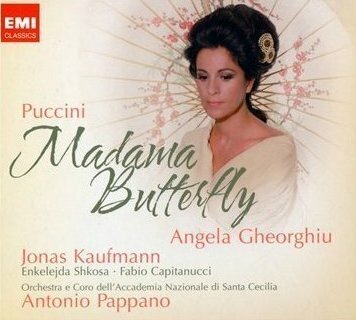 That said, Puccini's Madama Butterfly has a recorded legacy of over a hundred years already. Enrico Caruso and Geraldine Farrar recorded excerpts in 1908, and the work has been interpreted by many of the most illustrious names in opera ever since. This new set is entering a crowded field. Central to the success of the opera is, of course, a strong performance in the title role. Its arduous length and the trials of projecting sound and text over heavy orchestration are naturally lesser concerns in the studio than in the theatre, but the need for the soprano to be able to encompass pointed delicacy, long romantic phrases and some punishing dramatic outbursts remains. One of the role's other major challenges is the vast colour palette required to communicate Butterfly's journey from fifteen year old ingénue geisha to the abandoned but proud wife and mother of three years later, and these changes need to be delineated even more sharply on record for an interpretation to make its mark. Angela Gheorghiu has not appeared in the opera on stage because, she has said, the emotional demands of the role are so great. Based on this recording, it sounds as if the vocal demands may also be prohibitive. She certainly does justice to the score, and uses her highly individual, very beautiful, tangy voice with assurance and style throughout, but her lyric soprano instrument is frequently taxed, apparently to its limit. The high note climaxes in the love duet, the aria 'che tua madre' and the outburst following the sighting of Pinkerton's ship for example are all impressive but all sound the same, because Gheorghiu needs to give each of them everything she has in order to make the necessary vocal impact. Other Butterflys on record have had the resources to communicate ecstasy, outrage and triumphalist elation as required by these moments, but Gheorghiu's lack of ease and inability to dominate at such moments restricts her possbility to make interpretative choices. Something about Gheorghiu's velvety sound makes her unconvincing as a coy fifteen year old, but it does suit Act II well, and she is engaging and full of character in the conversation with Sharpless, becoming very moving when she introduces the child. Her interpretation grows in stature from this point onwards, but it is unfortunate that, in terms of temperament and timbre, she is most suited to the parts of the role that lie just a whisker beyond her means. It must be said that both the clarity and expressivity of her text are excellent, virtues which go a long way towards making one overlook the generalised vocal colours. If some compromises are necessary in order to accept Gheorghiu as Butterfly, no such concerns arise with the ideal casting of Jonas Kaufmann as Pinkerton. He has the requisite virility, legato sweep and pointed text to do full justice to his role and demonstrates, on occasion, some remarkable vocal beauty. As Suzuki, Enkelejda Shkosa's dramatic mezzo voice lends the character greater expressivity than the lyric mezzos who tend to tackle the role, and works well as a foil to the soprano's instrument. Fabio Capitanucci as Sharpless is pleasing and high quality without being especially distinguished. The smaller roles are all vividly performed and well sung, contributing to a sense of immediacy present in the whole recording. This immediacy is the most appealing feature of the set, and is mainly due to truly first class sound engineering and orchestral playing of remarkable finesse, beauty and passion under the direction of Antonio Pappano. The complex textures and imaginative instrumentation in the score shine through with excellent clarity, and many details have been revealed to me for the first time. The Orchestra dell'Accademia Nazionale di Santa Cecilia are in a different league compared to their playing on many famous opera recordings from the 1950s and 1960s which, though always demonstrating a great sense of style, could tend towards the rough and ready. Here, every section of the orchestra exudes class and demonstrates playing of the highest order, but the string sound and the woodwinds are particularly ravishing. If Pappano is thought of as primarily a singers' conductor, one only needs to listen to the orchestral interlude at the beginning of part 2 of Act II to hear that his skills in pacing and colouring this repertoire want for nothing. The sensitivity with which he accompanies Gheorghiu as she sings to the child to go on sleeping is breathtaking, and the ensuing build up to the tragic denouement from Pinkerton's re-entrance onwards has an ideal inexorability about it that leads to a hugely effecitve emotional climax. The Butterfly of Angela Gheorghiu does not rival those of Callas and Scotto for interpretative insight, or those of Freni and Caballe for vocal security, but it is nevertheless impressive and certainly isn't a reason to avoid this recording. Thanks to the excellent supporting cast, magnificent orchestral playing, Pappano's masterful command of the score and recorded sound that is sheer luxury, EMI have a great success on their hands that fully justifies adding another Madama Butterfly to the catalogue.